Whether or not to buy the Ruger American Rifle came down to a coin flip for me. See why I chose it and how it delivers! A few months ago I was overcome with two distinct itches. One was to buy a new gun and the other was to CoinStar the change in my change jar, which was beginning to weigh more than my children. In the end, the Ruger American won by virtue of its price. I had exactly enough money to pay the $375 price tag with what was in the coin jar. One could say that this story makes Ruger’s entire sales pitch when it comes to the American Rifle. It’s inexpensive yet comes with the kind of bells and whistles one would expect from higher priced rifles. The fact that I was literally able to buy a modern hunting rifle with loose change is the kind of garbage I would expect to see in a Ruger commercial, but there you go. I guess you win this round, Ruger! But “inexpensive” doesn’t mean “quality,” and although I was willing to give the American a shake based on its price point, it would still have to prove itself both on the range and in the field. I was finally able to to take it to the first today, and the results were rather striking. First the features. The American comes in four calibers for now: .30-06, .308, .270 and .243, some of the most popular hunting rounds out there. Ruger’s entire approach with this rifle has been to create an inexpensive but functional hunting rifle, so while some of the rifle’s features are top-notch, a lot of it is made to be as basic as possible, hence the limited options in cartridges. It has a single thumb safety that can only be engaged when the rifle is cocked, and it’s placed in a good spot to be disengaged when the shooter has a bead on the target. Mine came with a simple, lightweight synthetic stock with a rubber buttpad installed. The trigger pull is adjustable from three to five pounds and has no sign of grit. If you ever pulled a trigger on a Savage Mk II, as I did on this same range trip, the comparison is startling. It was just smooth. Some reviewers didn’t like it, but I did, so take it for what it’s worth. It comes with a single four-round plastic magazine. And, the coup-de-grace, the barrel is free floated. I get the feeling that along with being inexpensive, Ruger wanted this rifle to be easy to use and maintain for new shooters. There are two screws at the bottom of the stock. Remove these and the stock separates from the barrel and action. You have to do this in order to adjust the trigger. A hex screw at the front of the trigger assembly controls the pull weight. Turn one way to make it lighter, another to make it heavier. Put the two pieces back together and tighten the screws. 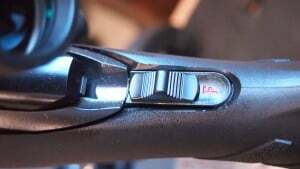 To remove the bolt from the action, you pull the bolt back and push a button on the left side of the receiver. The bolt slides out. To put it back, just do the reverse. A bolt-action rifle is generally easy to maintain, and the American is no different. You run a bore brush and patches through the barrel and wipe down the action with solvent and oil. Done. As mentioned before, the American has a safety switch at the rear of the receiver near the shooter’s thumb. 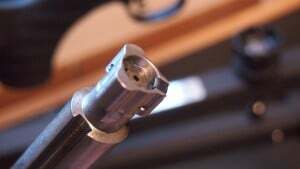 This is a good place for a safety on a hunting rifle because it lets the shooter keep the safety on until literally the second before the shot. Now, the click from the safety selector being moved is audible, and that’s good or bad depending on your outlook. I’ve known guys who use rifles with loud safeties, and that’s how they get the deer to stop before the shot rather than whistling. So, really, it’s something to be mindful of in a hunting rifle. This is a lightweight rifle, about six pounds unloaded. That means you’re going to feel more recoil. Ruger offsets this with a rubber buttpad in the stock, and it does a fair job absorbing the recoil from a .270. The thing I don’t like about the buttpad, however, is that it grabs your clothes when you shoulder it. The stock is a light composite that’s comfortable to hold but feels slick. If they could take some of the friction from the buttpad and put it in the stock, it would be perfect. The rifle comes with one magazine, but really, for this kind of rifle, it’s not like you need many. I’ll probably buy a second just in case the first one breaks (remember, plastic). Now, one interesting little addition that comes with the rifle that’s unusual to see is that it comes with Weaver scope bases already fitted to the rifle. Which means that all you need to buy are the rings and the scope. After all, it’s not like you can shoot it with iron sights, you’re going to put a scope on it, so they just go one more step and help you along. Another interesting note, and this may not still be going on, but by registering the rifle with Ruger online, I got a free cheekpad for my rifle. So if you do get an American, look in the box for the advertisement. This is still a fairly new rifle, and it’s a basic budget rifle to boot, so I don’t expect to see much in the way of upgrades or gadgets made specifically for this rifle. Check here for magazines, triggers, and some new stocks. Now it’s time to talk about how it shoots. 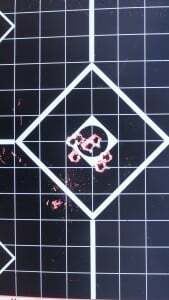 I used three different types of ammunition for this test, all in 130 grain soft points as that’s what I intend to hunt with and I’m not made of money: Remington Core Lokt, Hornady Interlock and the dark horse of the group, Prvi Partizan soft points. I included the PP because this is a budget rifle and it makes sense to see how it behaves with budget ammo since it stands to reason that inexpensive ammo may be all a person can afford. 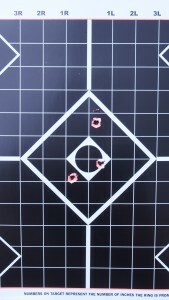 After a quick sighting in at 50 yards just to get in the ballpark, I moved up to 100 yards and shot three targets, three rounds each, each with a different ammunition. My first target was hit with the Hornady, and got them all in the same ballpark, which is about what I was expecting as I wasn’t using a Lead Sled but a leather sack filled with rice. Then I shot with the Remington and got pissed because I assumed that two of my shots must have went wild. Turns out I was wrong and the American just really likes Core Lokts. The third group was with the PP, and I got a similar group to the Hornady, which made me very suspicious of the Remington group. Maybe it was a fluke. So I loaded up with more Remington and just kept blasting at a fresh target until the range officer called a cold range. This was the result. Now, just a couple of things to keep in mind. First, no lead sled. This was done with a good canvas sling three blocks of wood and a bag of rice. Second, I had only shot maybe ten rounds from this rifle before I got to that first Remington group and sixteen before the second. It’s not like the rifle requires a lot of figuring out before you can start using it to hit something at range. Third, and this is more in compliment to the .270 cartridge, I had sighted in at 50 yards. Those targets are at 100 yards. 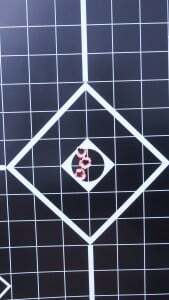 The .270 is a flat-shooting round. Just like Fox News figured out that if you put hot blondes in front of the camera to read the news people would watch it, Ruger has figured out that if you make a decent, not exceptional, but decent rifle for a low price, people would buy it. They finally figured out that, especially in this economy, your average Joe Hunter doesn’t want to pay $1,100 for a single-shot rifle (even though I want a Ruger No. 1 in .45-70 soooooooo bad!). They want to buy something that will get the job done without breaking the bank. The Ruger American does that and a little bit more, and that’s what makes it so attractive. If you’re someone who wants to go hunting but isn’t swimming in dough, you’re Ruger’s target customer, and boy are they trying to get your attention. It’s accurate, it’s comfortable, it’s easy to use and maintain, and it’s INEXPENSIVE. I have my dislikes for this rifle as mentioned above, but for $375 you don’t expect perfect. No one expects perfect from a budget rifle. That’s the beauty of what Ruger pulled off here. The American isn’t perfect, but it’s better than what you think you’re going to get for that price. This is an entry-level hunting rifle. It doesn’t have to offer anything else, but it does. I paid $375 for this rifle, and I’m happy with it. I’ll be happier after taking it hunting, I expect. All it needs now is a proper camo paint job and something to hold it during the drive to Missouri. I actually found your review of the Ruger American while doing research online, and you probably have one of the most thoughtful, well-written reviews on the web. So thank you for that, and also for giving me a clear picture as to what I should expect with the rifle. That price tag is just about all I have to know, but I am glad to hear its not a situation where you get what you pay for, it sounds like you get a lot more. 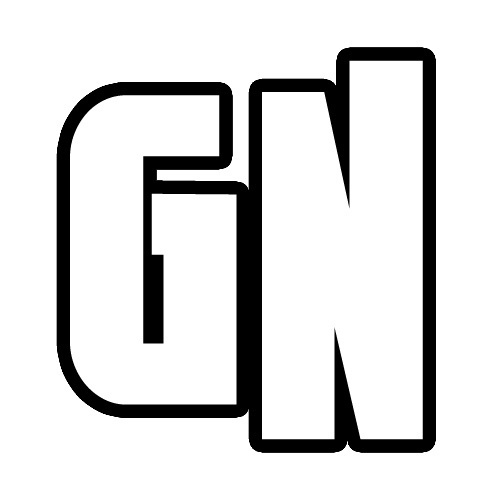 I just found your site and have found it very helpful and informative. So after that brown-nosing comment I have a question. As a true gun noob would I want to but the Ruger American in the .270, 30-06, or .308? I would mostly be target shooting but might take it on a hunt at some point but I doubt it. I really don’t know much about ballistics or differences in caliber in rifles or any guns for that matter. I did read that the kind of ammuntion that I would use makes a difference but am curious as to what would be the best option. I see that Wal-Mart is selling the Ruger American for Black Friday for $337 which is pretty reasonable I guess for a first time gun. Thanks again for any info! Keep in mind my opinion is just my opinion, but I’ll offer it in answer to your question. If this is your first gun and you “may” use it for hunting, I would not get a .270. The ammo is more expensive and not as varied. If it were me, the choice would come down to the .308 or the 30-06. Both are good rounds, both will kill anything in North America, and there’s a lot of different varieties of each. Of the two, in your situation, I think the .308 just barely edges out the 30-06. 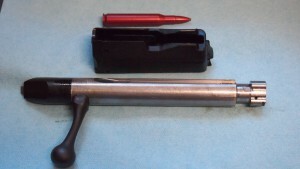 The .308 is essentially the successor to the 30-06, similar power but with a smaller case. The military still uses it in their light machine guns and some sniper rifles. It varies from cheap Russian steel-cased ammo all the way up to match-grade long range target ammo. That would be my recommendation. And $337 is a very good deal, IMO. I just found your site while searching for reviews on the Ruger American. This is an excellent review and I really like the fact that your review includes a range test. I also appreciate that you mentioned what ammo you used in the range test. Thank you very much. So I went to buy the .308 Ruger American today and the guy at Sportsman Warehouse said that I should buy the .223. He said that the ammo is much cheaper for someone like me that is just shooting targets and as a first time owner. I have no idea what the difference would be so that is why I am coming here. I won’t be shooting deer, elk, moose, bear, coyote, octopus or pretty much anything. Ok..maybe a wild boar. So Gunnoob..what is the dealio? 1. If all you want to do is shoot paper targets, the BEST place to start is a .22lr. Small, no recoil, and you can get 500 of them for $15. So while he’s right that .223 is cheaper than .308, .22lr is cheaper than both, and if you don’t intend to hunt animals larger than a squirrel or rabbit, .22lr will be the best bet. 2. If you think you’re going to be hunting deer or something larger than that in the future, .223 is not your best option either because several states won’t let you hunt deer with .223. The bullet is so small that it’s considered inhumane to hunt with a round that, unless you’re a great shot with it, won’t take the animal down cleanly. 3. Based on your previous comment, it was my belief that you wanted a Ruger American Rifle and all it came down to was what caliber. That’s why I replied the way I did. The reason I didn’t suggest a .223 or .22lr then was that the American doesn’t come in those calibers yet. So you might want to rethink the American if your number one goal is to hit paper. It’ll do that and do it well, and it will leave you the future option of hunting with it. But it won’t do it with .223 or .22lr, which seems to me what you should probably start with. If you want my no-kidding advice, here it is: Get yourself a bolt-action .22lr with some iron sights and practice a lot. The rifles are not expensive and neither is the ammo. When you’re ready to move to something bigger, you’ll do so with practice and a much better technique and you’ll have gotten both without breaking your bank account. Hope it all shakes out for you. .I bought one of these cheap pieces of crap in the 22-250 cal and the first shell I tried to slip into the barrel and close the bolt locked the bolt in the up position before I could rotate it down into the locked position. It will not move back to eject the shell or forward to fire. Worse I take it back the next day after the purchase and Cabela’s tells me they don’t have anyone/gunsmith on staff to do anything with it and tell me I have to go to a gunsmith and have the cartridge removed and maybe they will reimburse me for that but they will send it back to the factory for repair at no cost to me. The moral of this story is don’t buy this gun, but if you have to buy it somewhere that has an onsite smith and make sure you can get your money back if the thing turns out to be a piece of crap like mine (at cabela’s it’s black jack no backs). Needless to say this piece of junk is going to get sold as soon as I get it back! In response to Porschmn they do not make “this cheap peice of crap in 22-250 cal” in all due respect your ignorant to the situation and your not helping anyone your slamming a great rifle, because you simply do not know anything about it. I own and use the .308 Ruger American and it was/is everything you could ever want in a bolt action rifle for the price I hope they come out with some accessories here soon. You can hang a coffee maker off of an AR but can’t find a stock for an American. Id love to see a chassis system for this rifle, id be in line to buy one. To all the NOOBIES do not hesitate to pick one of these up they are awesome rifles its hard to go wrong with this platform !!!! I just picked up my new Ruger American yesterday (6/28/13) from Impact Guns for $299+ tax. A great price that I couldn’t pass up – can’t wait to shoot it. I am not sure how long this sale price will last, but I thought I’d mention it for anyone else who come across this blog researching this particular model. I bought the .30-06. Seems that Impact Guns was selling all calibers for $299, except for the .308. I own one of these rifles in .30-06. I put a 3-9×40 Redfield on it and did a basic zero of the scope with a Laserlyte in my house, which is about 15 yards from front door to back door. Got to the range, and after firing the initial 4 rounds, the windage was just about perfect, elevation at 50 yards was off just a bit, of course. Once I had it zero’d at 50, I moved to 100 yards. I’m not the best rifle shot in the world, but I was able to keep them in about a three inch area, even though my shoulder was getting tired. All total, I’ve put about 80 rounds through this rifle and it has functioned pretty well. I had a round hang in the magazine twice, but figured out that I didn’t seat them all the way aft when I loaded the mag initially. Once I made sure they were all seated before inserting the mag, no more problems. All ammo fired (Remington and Winchester) was 150 grain softpoint. The rifle was a present from my wife, so I don’t know exactly how much she paid, but if it was expensive, she probably wouldn’t have gotten it for me, ha ha. So, thanks Ruger, now I have a bolt action in my collection. 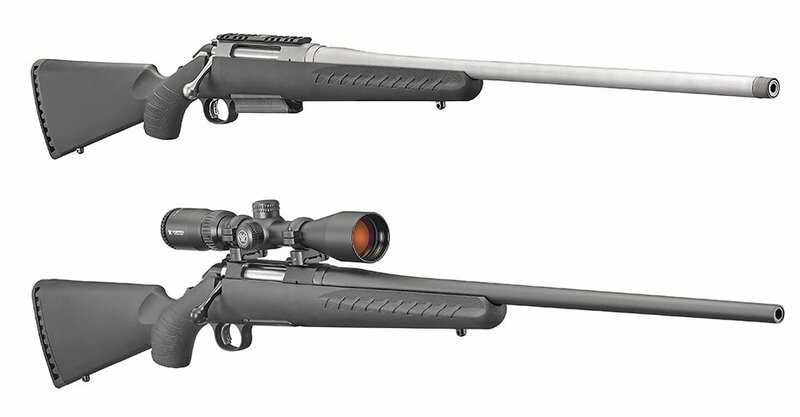 Ruger makes a 22-250 as well as a 7mm-08. I just bought a 22-250. Ruger makes the 22-250 in this rifle I just saw one in our local store here in Wv. Almost bought it,, But I’ll keep my M77 Mk-2 instead in a 2506,,does a heel of a job at 100 yards and I don’t have a longer place to shoot, ,, so it is right on in my place of use..
Bought mine over a year ago in 30-06. I own many rifles and this is by far my go too hunting rifle when deer season comes around. Great gun, very accurate, reliable, tough , and very easy to use/ assemble and disassemble all this for a great price! Also if you want more accuracy search for the trigger mod online. Makes the trigger more amazing than it already is and you’ll shoot way better. I bought the 308 ruger american at w mart. It likes the 150 grain corelok ammo, shooting 1″ groups. I’m going to try the blue box federal powershok today. Trigger is great, stock had issues with contact on barrel. A little Abra fi g the stick seemed to fix that issue. Recoil pad is really nice. Is it worth the coinage? In my opinion- yes…. I just got the ruger american 22/250. I want a wooden stock for it. The Ruger American works great for me. I bought one 10 dollar raffle ticket and won the American in .243 Winchester. Then I put a Redfield Revolution 3-9x40on it and last year I downed two whitetails with two shots and about 100 yds. So I think Ruger has it figured out. If anybody wants aftermarket stocks try Boyd’s. Just picked up a Ruger American in .308 last night, I am so pumped to put a few rounds down range. Now to see if I can get a good deal on a scope (Christmas specials and such). I decided on the .308 cartridge for the sheer fact there is nothing in North American I won’t be able to harvest with this round. I was thinking of buying a 22-250 or 223 for about 30 years. Finally bought the Ruger American in 223 on sale at a Gander Mtn. store. I put my 3×9 Bushnell scope on and am ready to go. Took a few shots with some ammo I picked up at a garage sale a long time ago at 25 yards. I can almost hit a tack. Will try it at 200 yards when I get time. Long distance crows are going to get a surprise this winter. What caliber is the most accurate out to 100yds (deer hunting in Georgia woods)? the article lists 30-06, .308, .270 and .243, but I’m told there is a 7mm now. Hey Bruc, for 100 yards you can’t go wrong with any of those. Make sure you have a decent rifle, scope, and mount. i traded for a 30.06 ruger american but it has no bolt assembly anyone know where i could pick one up? thanks jesse . Hi Jesse, you might need to call up Ruger if you’re having a hard time finding it online.